The Treasure Valley Orchid Society was founded in 1971 by a dedicated group of orchid enthusiasts who came together to share their knowledge. TVOS began with seven members and has grown to over sixty today. Our purpose is to promote the appreciation of orchids, to encourage the exchange of ideas concerning the culture and growing of orchids, to conduct orchid exhibitions and shows for member fellowship, and to advance the knowledge and appreciation of orchids. 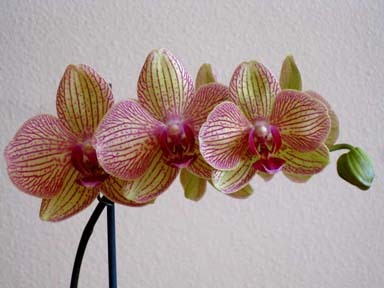 ​Membership in the Treasure Valley Orchid Society is $20 per individual and $30 per couple or family. Membership includes access to the club's extensive library of books, bulletins and videos on orchids and orchid cultivation. Each meeting offers an informative program, and a beautiful and interesting display of blooming orchids. There are also plant sales, raffle plants, and door prizes. As a member, each month you will receive the Orchid Chat newsletter to keep you up to date on what's going on in the club. ​The Treasure Valley Orchid Society meets on the third Wednesday of each month from September through May, at the Club House at Signature Point Apartments, 3509 N. Cole Road, Boise, ID 83704. Doors open at 7:00 PM for socializing and to provide members the opportunity to have questions answered about their orchids. Meetings begin at 7:30 PM. Refreshments follow. In June and July, events such as a plant auction and family picnic, and an annual greenhouse tour can take place and will be scheduled by the membership at one of the monthy meetings. August is scheduled as vacation month.